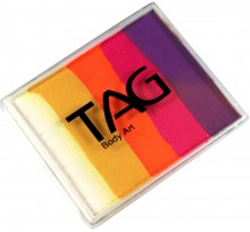 TAG Sunset Split Cake contains four regular colours and two neon colours side by side. Click here for a Material Safety Data Sheet for TAG Neon products. 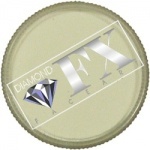 Please note: Although we don't have statement from TAG paints regarding neons, they are the same as Diamond FX. We therefore, wish to bring to your attention that the green, magenta, orange, pink and yellow neon products are for use in special effects and use in hair and are not suitable for use as cosmetics. This statement is to comply with EU regulations and many painters use these paints regularly. These colours are approved by the FDA for use as a cosmetic item. The USA is the only country in the world where such an item may be distributed labelled as "for cosmetic purposes". The statement "not a cosmetic item, not intended for cosmetic application" is for legal reasons only. I bought this for a simple and effective butterfly and it's beautiful! The colours are so striking together. This split cakes is pretty and bright, it's perfect for creating butterflies. It goes on easily and is a pleasure to work with, I'll be replacing it once it's used. Loved this split cake, very vibrant colours and no staining.